Roll Call’s list of the People to Watch in 2019 continues with three players from outside the Beltway expected to play key roles on the political and policy fronts. One is working to give immigrant communities greater representation in the public sphere. Another is a state attorney general squaring off with the Trump administration in the courts. And the third is a Canadian politician whose government has plenty of concerns about U.S. positions on trade, human rights and democratic principles. Many people think running for office is only for the wealthy and well-connected. Sayu Bhojwani is trying to break that cycle. After Congress in 2007 failed to pass comprehensive immigration overhaul, Bhojwani in 2010 founded New American Leaders (NAL) an organization that works across the country to train first- and second-generation Americans to run for public office. Bhojwani, 51, who was born in India, raised in Belize and is now a U.S. citizen, says the organization seeks to put more people in office who will accurately reflect the communities they represent. NAL has trained more than 600 people since 2011, and 70 have so far achieved public office. In the 2018 midterm elections, nine won state legislature seats, five won in city councils, seven were elected to school boards, and seven more received various political appointments. No NAL alum has yet been elected to serve in Congress, although Bhojwani was clearly moved by the wave of immigrants and first-generation Americans who ran last year and succeeded including Democratic Reps. Alexandria Ocasio-Cortez of New York, Ilhan Omar of Minnesota and Rashida Tlaib of Michigan. “We have to be our strongest advocates,” she says. Bhojwani said Tlaib and Omar were largely successful because they reached out to young voters who felt ignored. Both joined the NAL network after they were elected to office. Bhojwani came to the U.S. as a college student to attend the University of Miami and observed how newer citizens weren’t adequately represented in government, and how immigrant voices were routinely ignored. Before founding NAL, she served as New York City’s first Immigrant Affairs commissioner and created the South Asian Youth Action group, which is a community advocacy and empowerment group for immigrants from the subcontinent. Bhojwani says her work in that job showed her the importance of bringing a mix of voices into government institutions where policy is made. “As a commissioner in government I was able to see what it meant to have a diverse voice at the table. I bring my own lived experience,” she says. Bhojwani says many people working with the organization are hesitant to run at first because they do not think they have a big political network or enough financial backing to quit full-time jobs. To counter that reluctance, NAL holds training sessions across the country every year that teach potential candidates about campaign finance, how to effectively communicate their messages and how to amplify their immigrant backgrounds to gain support from local communities and mobilize people to go out and vote. The organization also teaches people how to identify and use the small networks where they already belong. The organization encourages potential candidates to own their stories and embrace their immigrant roots to connect with voters from diverse backgrounds. Bhojwani says the spike in first- and second-generation Americans running for office is a result of the 2016 presidential election, but not for the expected reasons. Bhojwani hopes that the organization will continue to expand and will eventually change the way all levels of government are run — from Congress to the town council. “We have a system that was designed for an America that our founding fathers envisioned, and now we have a very different America and it’s really up to us to build a system that’s going to work for that modern, more multiracial America in which it’s not OK for a small group of people to make decisions on behalf of millions of Americans,” she says. 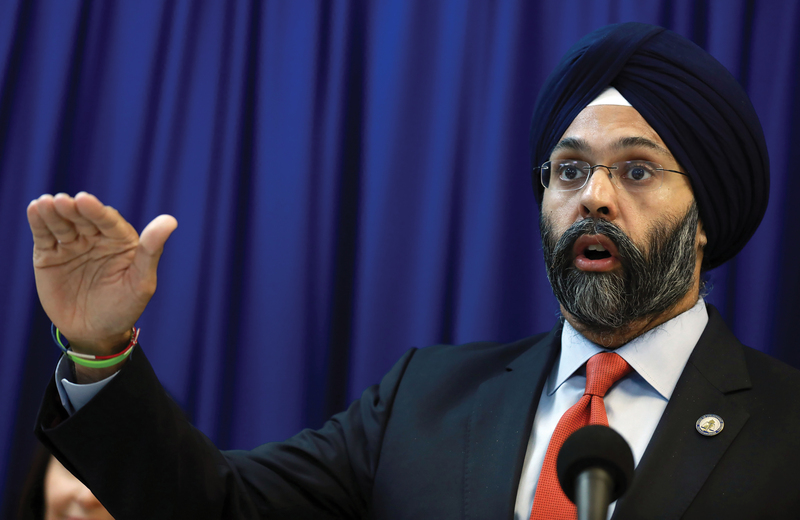 Gurbir Grewal didn’t come into the New Jersey Attorney General’s Office spoiling for fights with the Trump administration, but that’s how he ended up spending his first year in office. In an era of unified Republican government in Washington, Grewal, 45, who was appointed by Democratic Gov. Phil Murphy, saw his office providing a last line of defense for New Jersey against the most controversial and consequential of President Donald Trump’s actions on virtually every policy front. Instead, when evaluating whether to challenge an administration action, he says his office applied a two-part test: Did the action violate a law, rule or norm? And, more importantly, did it affect New Jersey residents? Throughout the year he and his staff found themselves “answering yes to both those questions” at an alarming rate, he says. In states like Minnesota and Colorado, the 2018 campaigns of several Democratic nominees for attorney general mirrored Grewal’s aggressive approach to the administration, especially on immigration and health care. No one in New Jersey before Grewal had harnessed the attorney general’s office to go as directly after the federal government. Changing the mission and the mindsets of 8,000 workers there was one of the primary challenges of his first year, he says. He used a similar management style in his previous job as Bergen County prosecutor, a position he was appointed to by former Gov. Chris Christie, a Republican. He’s likely to continue that record, but with less focus on direct confrontation with Washington and more on using the office’s rule-making power to change New Jersey policy. The Garden State is somewhat unusual in that its attorney general is appointed, not elected. The office is also more powerful than the national norm, with control of the state’s law enforcement bureaucracy and much of its regulatory enforcement. Moving into 2019, the new Democratic majority in the U.S. House can serve as a check on the administration, a role Democratic state attorneys general played in Grewal’s first year, he says. That will free his office to craft its own policy on consumer issues, environmental protection, the student loan industry and law enforcement operations. An early example was a directive Grewal issued in November, telling state and local police to limit their cooperation with federal immigration officials. The son of Indian immigrants and the first Sikh attorney general in the U.S., Grewal talks about the “human face” of immigration enforcement and has taken steps to protect immigrants brought to the country illegally as children. But the immigration directive was based more on his experience as a prosecutor. As a federal prosecutor Grewal worked well with Immigration and Customs Enforcement on a variety of cases and says he has “nothing against” the agency. But as a county prosecutor and early in his tenure as attorney general, he saw a “shift in immigration enforcement,” including sweeps near schools and other sensitive areas, he says. The change scared witnesses away from testifying in domestic violence cases, for example, and undermined prosecutors’ work. Canadian Foreign Affairs Minister Chrystia Freeland spent a recent Saturday morning welcoming teenage Saudi asylum-seeker Rahaf Alqunun at the Toronto airport. The 18-year-old had lobbied for protection on social media, claiming physical abuse by her family, who she said was forcing her into an arranged marriage. She fled her home and made it to Thailand before accepting Canada’s offer of refuge. “It was a pleasure for me this morning to welcome to her new home a very brave new Canadian,” Freeland said Jan. 12. The action was par for the course for Freeland, who as part of Prime Minister Justin Trudeau’s Liberal Party government, is establishing her country as a global human rights leader. It was also gutsy, coming amid rising tensions between Saudi Arabia and Canada. Freeland, 50, and a native of the province of Alberta, entered Canadian politics in 2013 after a career as a news executive at the Financial Times, The Globe and Mail and Thomson Reuters. A Harvard graduate and Rhodes scholar, she speaks English, French, Ukrainian, Russian and Italian. She joined the cabinet first as international trade minister in 2015 then moved to the foreign affairs spot in 2017. She seems to relish being the point person for the Trudeau government on foreign policy, trade and more recently on human rights and gender equality, and has not been shy about standing up to Washington. She has chided the Trump administration for retreating from the world stage and declared that Canada will uphold the values of internationalism. Corker, who met with Freeland several times during negotiations to revise the North American Free Trade Agreement, said he found her “very direct” and a strong advocate for Canada. “There’s no gamesmanship,” he said. Freeland has used her Twitter account to call out governments, most recently slamming Venezuela’s President Nicolás Maduro. “Having seized power through fraudulent and anti-democratic elections held on May 20, 2018, the Maduro regime is now fully entrenched as a dictatorship,’’ she tweeted last month. On human rights, Canada and the United States have sharply differed in their response to alleged human rights abuses by the Saudis. In 2018, Canada publicly challenged Saudi Arabia about arrests of activists for women’s rights and civil society and called for their release. The Saudis responded by ordering Canada’s ambassador to leave the country and threatening to shut Canada out of future business deals and contracts. It’s a stark contrast to the reactions of President Donald Trump and Secretary of State Mike Pompeo. After the murder of Washington Post columnist Jamal Khashoggi, Trump and Pompeo declined to back the findings of the CIA that Crown Prince Mohammed bin Salman knew of and possibly ordered the killing. Both have resisted congressional efforts to punish the kingdom over Khashoggi’s death and the Saudi military campaign in Yemen, where 15.9 million people, 53 percent of the population, face “severe acute food insecurity,” and famine looms, according to the United Nations. 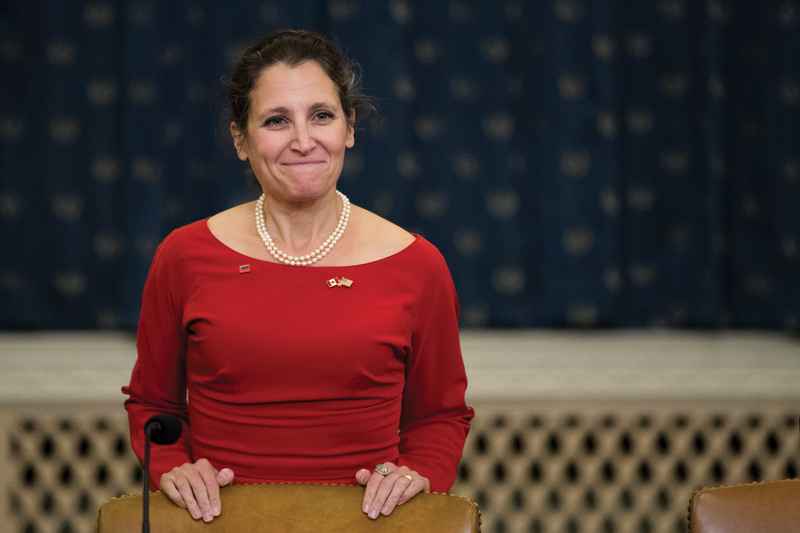 On trade, Freeland and U.S. Trade Representative Robert Lighthizer negotiated hard as Canada fought several U.S. proposals during talks to revamp the 1994 NAFTA before reaching an agreement that still must be ratified. Freeland told interviewers at the time that the last hours of negotiations were so intense that she lay on the floor of the prime minister’s office in exhaustion at the end. The Angus Reid Institute, a nonpartisan polling and research organization in Canada, awarded her the top performance score among Trudeau’s ministers last year. But Freeland and Trudeau say there is still unfinished business. They want the U.S. to lift a 25 percent steel tariff and a 10 percent aluminum tariff on Canadian products the Trump administration imposed on most imported foreign steel and aluminum in the name of economic and national security.